New version of the module "Introduction to microstructures"
As in all FILIPE’s scientific modules, the presentations and activities of this new module are designed for non-French speaking students and are geared towards familiarising them with the subject’s key vocabulary and the recurring structures of scientific French. To practice oral comprehension of specialist French, so as to be able to follow scientific lectures in French. While it offers numerous grammatical revision points, FILIPE does not provide general French training. Ideally, the program will be offered as a complement to traditional linguistic training. French teachers require no prior scientific experience to give pedagogical support to students over the course of the modules. Pedagogical documentation is made available to tutors. Teachers can also be provided with specific training. FILIPE is aimed at students who have already received at least 200 to 400 hours of general French training (level A2 - B1 of the Common European Framework of Reference for languages). The scientific notions laid out in the presentations correspond to levels L1 - L3 (1 to 3 years after high-school graduation). The multimedia modules on offer are produced by FILIPE’s partner establishments to aid the teaching of specialist French in science and technology universities abroad. 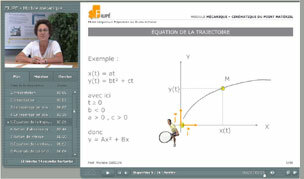 These combine audio or video presentations on a number of scientific disciplines, with French-language activities in the form of interactive exercises. On average, each module contains around 20 hours of work for students. FILIPE content is circulated under a Creative Commons licence. A licence attached to each module specifies its terms and conditions of use. Click on the image in the module’s interface to read these terms and conditions. FILIPE’s modules offer guided and carefully paced training courses in the form of a series of exercises. We recommend that students go through each module’s activities in the order presented. However, the course can be tailored by the student or tutor according to the student’s requirements or the time available. The modules include detailed instructions and a navigation aid allows autonomous learning. However, the tool is most effective when used in blended-learning mode. The figure below shows one of the scenarios suggested, in which self-learning periods are supplemented by tutored sessions on either side. The training departments of French industrial groups in France and abroad, etc.